APPSC Jobs: Andhra Pradesh Public Service Commission has released a calendar for recruitment of Jobs in the year 2017-18 for various categories like Group-1, 2, 3, 4, Panchayat Secretary, Engineers, Assistant Motor vehicle Inspector and so on. The vacancies are still to be cleared by the Finance Ministry of the Government and the details of vacancies will be available at the time of announcement of the exams. No. 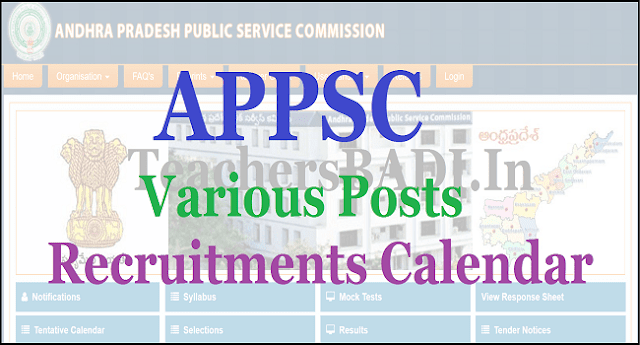 of posts, Eligibility criteria, Application fee, APPSC Various posts recruitment Exam pattern, Syllabus, Selection procedure, How to apply(Online applying Procedure), Last date for apply, Screening test date, Main Exam date, downloading of Hall tickets, Certificates verification, Final Results announcement and more information to be placed on appsc web portal. Government and furnishing of indents by Unit Offices. 2. In case Government accords clearance for other than the posts mentioned above, the notifications and examinations shall be scheduled accordingly. than 25000, the main examination is proposed. The Commission conducts Screening Test in Off-line mode in case applicants exceed 25,000 in number and Main Examination in Online-mode for candidates selected in screening test.